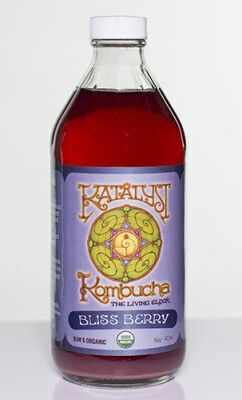 Our Bliss Berry kombucha is is made by blending our raw and organic kombucha tea with fresh-pressed, organic, wild blueberry juice and ginger juice. We source our delicious organic blueberries from farmer Ben Perrin at Burke Hill Farm in Cherryfield, Maine. We press all the berries in-house for an incredibly fresh and delicious blueberry flavor. We also press fresh organic ginger root to give Bliss Berry just a touch of spice. Our Green Lovin kombucha is is made by blending our raw and organic kombucha tea with blue-green algae and cordyceps mushrooms. We use high quality organic E3Live algae and super potent cordyceps nano from Aloha medicinals. 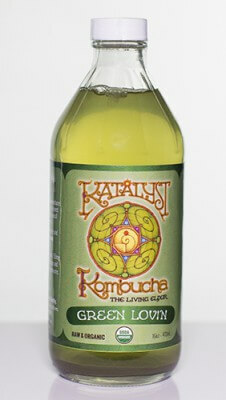 This is our flavor for energy and endurance and we think that it is quite a great tasting green drink. Who would have thought that pond scum, yeast, bacteria, and mushrooms could taste so good! Our Schizandraberry kombucha is is made by blending our raw and organic kombucha tea with organic schizandraberry puree from Chang Farm in Whatley, Massachusetts. What the heck is schizandraberries you might ask? Check out our good friend Dr. Chang’s page on everything Schizandra. And the taste is just stunning! Our Ginger Devotion kombucha is is made by blending our raw and organic kombucha tea with a whole lot of fresh-pressed organic ginger juice. 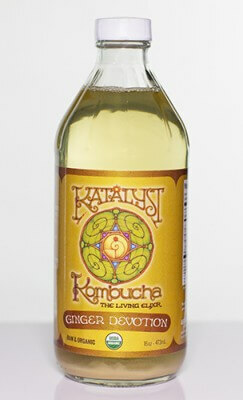 We press raw organic ginger root in-house to add to Ginger Devotion for a potent blast of tropical heat. 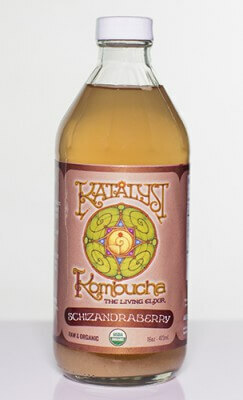 Our Jasmine kombucha is a favorite here at the brewery. We use a beautiful long leaf jasmine green tea in our tea base instead of the green and black tea blend that is the base for all of our other flavors. 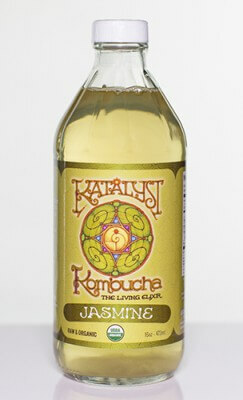 Jasmine is a clean and floral flavor that makes for a wonderful kombucha tea, and we think you will like it too. 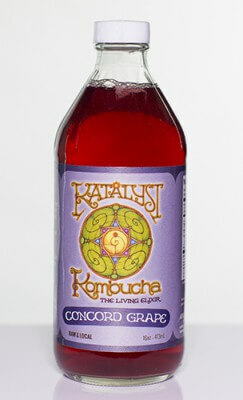 Our Concord Grape kombucha is is made by blending our raw and organic kombucha tea with concord grape juice from Growers Cooperative Grape Juice Company. First organized in 1929 with 8 growers, there are now 150 growers with 3,400 acres of Concord grapes, producing about 20,000 tons of Concord grapes each harvest season. We love supporting other Co-Op’s and we think you will love this newest flavor in our lineup. Organic coop-grown Tea and Sugar from Equal Exchange, W. Bridgewater, MA. 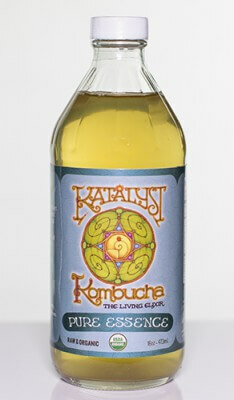 Our Pure Essence is our straight up kombucha tea with nothing else added. It maintains the delicate flavors of the green and black teas used and provides a great base for your own mixes and juice blends at home.